Ed Miliband Leader of the Left? Ed Miliband is the leader of the Left, a revelation made recently in a broadcast with BBC/Independent journalist Steve Richards. Although, Miliband appears more interested in identifying himself with Conservative politicians, concepts and with Mrs Thatcher`s legacy – obsequiously describing her as a conviction politician. In his early thirties we discover that Miliband`s summer reading was Iain Macleod’s biography, Ed Milibands`s `One Nation` agenda clearly has had a longer gestation period than cynics might have thought. The Disraeli citation highlighted in the broadcast was further evidence that the philosophical underpinning of Miliband`s big idea is a Conservative/reactionary one. The only left-winger mentioned during the programme was Ralph Miliband, the father of the Labour leader, a brilliant Marxist thinker who sadly died in 1994. Miliband`s position was considered analogous to Mrs Thatcher`s period in opposition, a correlation that allowed for a comparison with Miliband by Charles Moore. Richards returned to Thatcher`s legacy indicating that she developed a strong populist message, a political outsider who produced a critique of the former government led by Ted Heath in which she served. A politician who overturned the Keynesian post-war consensus, whose populist message was based on the notion that the state needed to get off peoples backs. This analysis requires revision. While Mrs Thatcher was a political outsider she served in a high ranking Ministerial position under Heath, at the Department of Education, earning the moniker, “Milk-Snatcher”. Her department was a high spending one, the future doyen of monetarism initiated an increase in public spending on secondary and comprehensive education – predating her foray into Thatcherism. Margaret Thatcher altered her outlook, thanks to Keith Joseph, Enoch Powell and the Chicago School and due to her experience in government with Heath. Heath (a `One Nation` Conservative that Miliband does not appear to reference), from 1970 -72 morphed into Selsdon Man, a position from which he retreated, when unemployment rose rapidly and when Heath nationalised the Upper Clyde Shipyards, despite the government`s promise not to bail out so called `lame duck` companies. Mrs Thatcher effectively adopted the Seldson agenda in 1979 and her subsequent announcement that “the lady is not for turning” was influenced by Heath`s U turn. Labour of course jumped on the monetarist band-wagon well before Mrs Thatcher, with Denis Healey`s budget in 1976 and Jim Callaghan`s conference speech rejecting Keynes– the IMF held greater sway over Labour than the TUC ever did. Mrs Thatcher`s right-wing populist inclinations also deserve proper scrutiny, especially the infamous statement made in 1978, when she claimed that Britain was “swamped with immigrants”. We are told that Miliband and advisers are obsessed with Thatcher avidly reading her speeches while she was in opposition. It is hoped they draw some sensible conclusions from this but Miliband`s summer dalliance with `English Nationalism` suggests the opposite is true. Listening to Miliband it is clear the Blair/Brown legacy dominates not only his politics but his manner of communicating, for example in his phraseology and tone when he says “but what I tell you very clearly” or his constant use of the word, “look” and the refrain of “you know” which made him sound very like Tony Blair a political affectation that Miliband has developed. Then again, Tony Blair once had the Midas touch his political influence and style live on and Miliband`s attempt to distance himself from both Brown and Blair may prove the greatest challenge. His conference speech in 2011 is examined when Miliband spoke about “predatory capitalism” which Richards rightly critiques for the lack of substantive detail (although commends for its bravery) and for Labours refusal to cite any companies who came within the predatory category. There is an interesting discussion on the theme of rail nationalisation, when Richards asks if this is likely to happen under the current Labour leader. Miliband sounding like mini-Blair deals with the question saying he will give a “clear answer to that I am absolutely open minded about how the rail system goes in the future.” This was as clear as mud, Richards correctly pointing out this was no answer at all. However, Miliband has altered his position on a variety of issues Iraq, Civil Liberties and the failure to regulate the markets. He informs us he was concerned about the policy trajectory while Labour was in office, though there was scant evidence that he challenged the prevailing orthodoxy when it mattered, in Cabinet or with either Blair or Brown. The `leader of the left` is policy light and the broadcast pointed out that David Cameron had made far greater head-way in this area while in opposition. 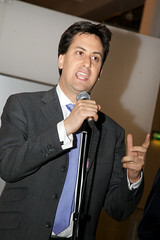 Although Miliband alluded to a variety of measures linked to the living wage, youth employment and further bank regulation. How Labour propose to handle the deficit did not feature as in his conference speech the matter avoided, the Left deserve to know what their leader thinks on this matter. Miliband suggested that his policy deficiency is a good thing and that “no Labour leader from the past have urged me to have more policies.” Richards missed his opportunity to ask who gave this advice it would have been interesting to hear the answer. Instead Miliband was questioned about Gordon Brown and Ed readily provided a critique – politics is after all a rough business. Brown apparently did not know where he “wanted to take the Country” which contradicts Miliband`s lackadaisical commentary regarding a lack of policies – could this be because Brown was policy light or badly advised? The broadcast suggested a lack of substantive policy from Labour and poor command of detail. For example the explanation by Miliband`s advisor on `Predistribution` was painful to hear, then again it is an incomprehensible concept that few could have explained and Richards was correct to gently dismiss the explanation with a joke and a laugh. If Cameron was listening he no doubt was laughing also and that is a worry for the Left and its newly proclaimed leader.